When you try to search anything on google, you will notice that every result in google search engine are having very long url. Sometimes we need to get only direct address of the search result instead of having those long URL. Here is a method get direct destination address in google search. If you are not getting what I’m saying here, then go to google.com and search anything. For example I tried to search “make money online”. When you get results, try to select any result and right-click and choose Copy link address of any of the result. The link of those result will look something like this. So in this article I’m going to show you how we can get direct destination address/original URL in the search result itself without visiting the result page. Why we need get direct web page address in Result itself? In most cases we don’t need this function. But if you are webmaster like me, then this function will be useful when you conduct SEO auditing. Recently I have been working on my site SEO to improve ranking. When I was doing this, I noticed some omitted results included in search result for my site. To remove all those link I need to submit URL remove request in google webmaster tool. But to submit all those URL removal request in webmaster tool I need to get the URL which need to be removed. Instead of opening all the URL’s one by one, it is better to copy the URL address directly in search result itself so by this way we can save some time and fasten the process. Even though if you try to open URL by clicking search result, some URL will be redirected to another page so you don’t get those URL. Now we don’t have any option other than typing URL address manually. To avoid all those problem I’m using this script. By default google won’t provide direct address in search result page. But we have script/extension by which can directly copy the destination URL address in search page itself. For this we need 2 things, one is Google Chrome/Firfox browser and Scrub Google Redirect Links script. In this tutorial I will be using google chrome browser. 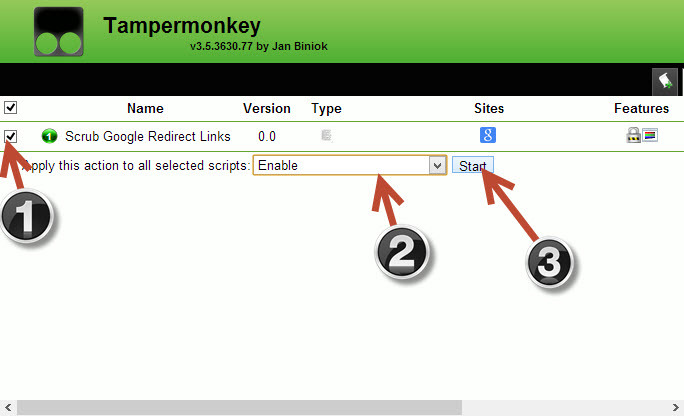 To install Scrub Google Redirect Links script on google chrome browser, fist install tampermonkey extension. After installing tampermonkey extension restart your browser. 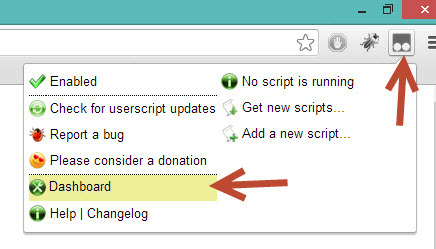 After restart now visit this script page on userscripts.org. And look for Install button at right side of the page and click Install button. Once you click install you see confirmation message, just click OK to continue installation. 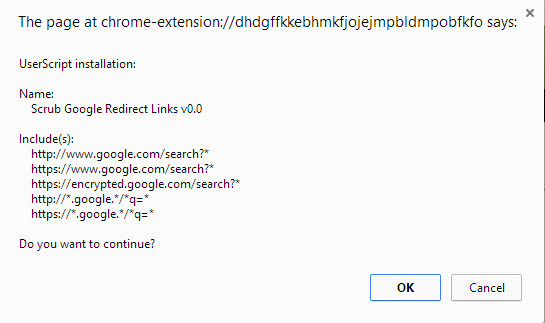 Now we have installed Scrub Google Redirect Links script on chrome. It’s time to activate that script. To activate that script, open tampermonkey dashboard by clicking on Tampermonkey icon at right side of your browser and choose Dashboard option. Now we are in tampermonkey dashboard. To activate that script, first select the script and choose Enable option in drop-down box and click Start to activate that script. After activating restart your browser. How Copy Direct URL address in Search Page? After activating scrub google redirect links script, open google search page and search for any word and choose the result which you need to copy the direct URL address and right-click on the title and choose copy link address to get direct URL address instead of redirect URL address. 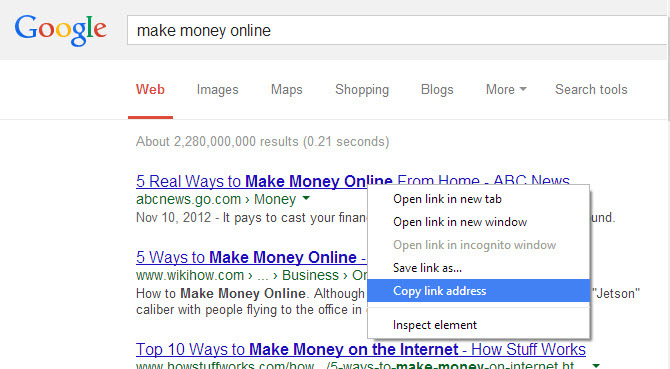 You can also remove all the ugly long url from google search result when you open any result from google search engine. If you are an SEO guy then this script will be useful for getting destination URL address directly in google search page itself. Or if you are normal guy and hate seeing those long URL when opening google search result and also hate redirects, then you can use the script to avoid those ugly URL and extra redirects. I use http://urlcrop.com/ . You can also just paste the link and get the real link instantly. Has a clean, clutter-free interface without any ads.